1) The easiest way to do this is to take an envelope or a bag of some sort, and glue that on the page. It's fun to use envelopes with windows or plastic bags or translucent bags. 2) You can also glue a pocket in by adding glue or double-sided tape on the edges of a page, or tape it on place. It doesn't need to be a rectangle, you can use any shape as a pocket. 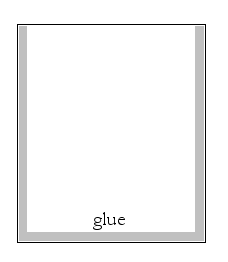 3) Glue two pages together at the edges, leave the top open. That is sort of a hidden pocket. You can also leave the side open. Or you could glue the pages together at all sides but leave them unglued in the middle, and cut a slit in one of them to create a pocket. It might be a good idea to glue the top of the slit on the "background" page, to make it easier to use.